So while you’re out cruising the town on your bike with your bump, don’t skip the sunscreen. More so while pregnant than any other time, you are susceptible to sun damage. This is because of the hormonal changes happening in your body. These hormonal changes make you more susceptible to melasma aka pregnancy mask. Melasma is defined as brown pigmentation around the eyes, on the cheeks, forehead, and sometimes the upper lip. Melasma is more strongly triggered by sunlight exposure. This is not to scare you from leaving your house but it’s just to forewarn you that you could get pregnancy mask if you don’t give a little extra care to protect that pretty face. And just so you know it will eventually fade once the hormones go back to normal after the baby is born. 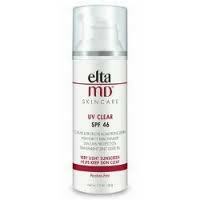 My favorite facial sunscreen is Elta MD Skincare UV Clear SPF 46. I have really sensitive skin that breaks out easily. This sunscreen, though a tad on the expensive side, is totally worth it. I feel like it doesn’t leave me looking greasy and keeps my skin clear. I also have never sunburned when wearing it, even when getting in and out of water.